It seems absurd, but I think the OPI Color Paints collection might be too awesome to review. Dunno if I'll be swatching them in the traditional way. 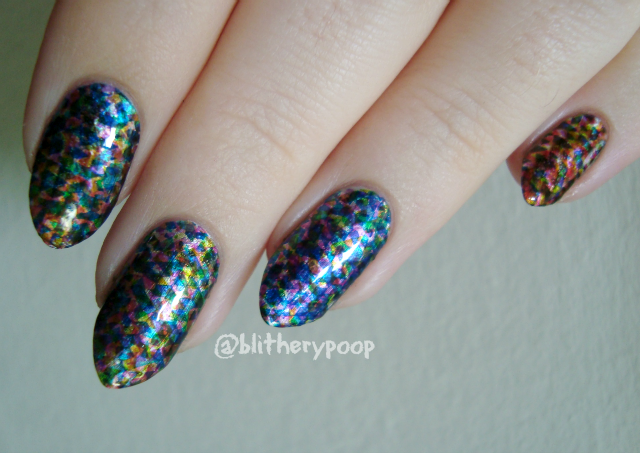 They're certainly wearable as-is, but they're bursting with nail art potential. Almost the moment they arrived, I started playing with them. I didn't want to stop! My watermarble (which will be on here soon) gave Nichole the strongest lemming I've seen her have for a mainstream brand collection in....maybe ever. She got the whole set for Mother's Day just a couple of days later and also jumped right in to arting with them. You need it too! If you watermarble, stamp, dot, or do pretty much any kind of nail art at all, you need these! Nichole and I are both completely in love with the collection and I'm starting our parade of affection with some layered stamping. That's right, they STAMP!! That takes their potential to a whole other level. I used all eight Color Paints jellies with the Winstonia's The Carnival plate (last image in the top row) over a base of Silver Canvas. The result is complex and chaotic, but the technique couldn't be easier. It's just like double stamping, but with more colors. By rotating the stamper between each new color layer, they overlap. 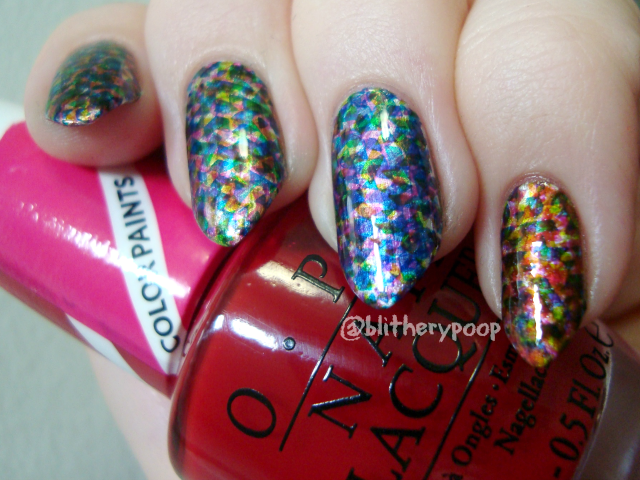 OPI calls the Color Paints "blendable", which makes complete sense when you see them used together. They're all sheer enough that they do "blend" when they're layered thinly over one another. Silver Canvas illuminates them in a way that a white base wouldn't. 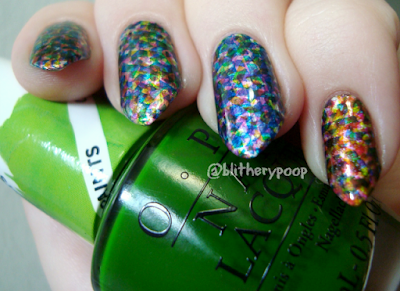 The result looks like nail foils, it's that metallic and glowy. Bottom line: Great formula, bold colors, and they're perfect for nail art. I bought the whole set (yes, even the pinks) and my only complaint is that they only did eight shades. I'd buy twenty if they made them. They're that wonderful. Silver Canvas is a little brushstrokey on its own, but sets the jellies alight. Someone on Nail Board asked me for a tutorial on layered stamping. Would anyone else be interested? It'd be a good excuse to do another design the same way. Most definitely I'd be interested in a double stamping tutorial! I'm going crazy drooling over Color Paints posts right now! I caved and ordered the full set on Ebay so I wouldn't miss out, and while that was only 5ish days ago, I'm really getting impatient! Dang, that's hot stuff! You guys have already done the coolest things with this collection that I have seen.